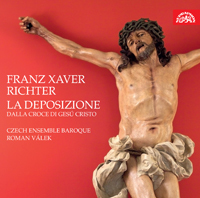 FRANZ XAVER RICHTER (1709-1769): La Deposizione dalla Croce di Gesù Cristo. Description: This 1748 oratorio, Richter’s only one in Italian, is in his characteristic style, combining baroque composition principles (Fux-like counterpoint choruses) with the achievements of the nascent classical style. 2 CDs. Italian-English texts. Kateřina Knežíková, Lenka Cafourková Duricová (sopranos), Philipp Mathmann, Piotr Olech (countertenors), Jaroslav Březina (tenor), Czech Ensemble Baroque Orchestra and Chorus; Roman Válek.